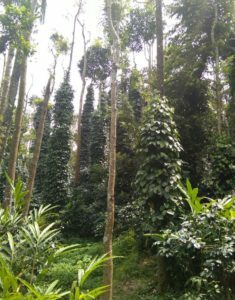 “We grow arecanut, cardamom, banana, pepper, jackfruit and other forest trees in our coffee estate. 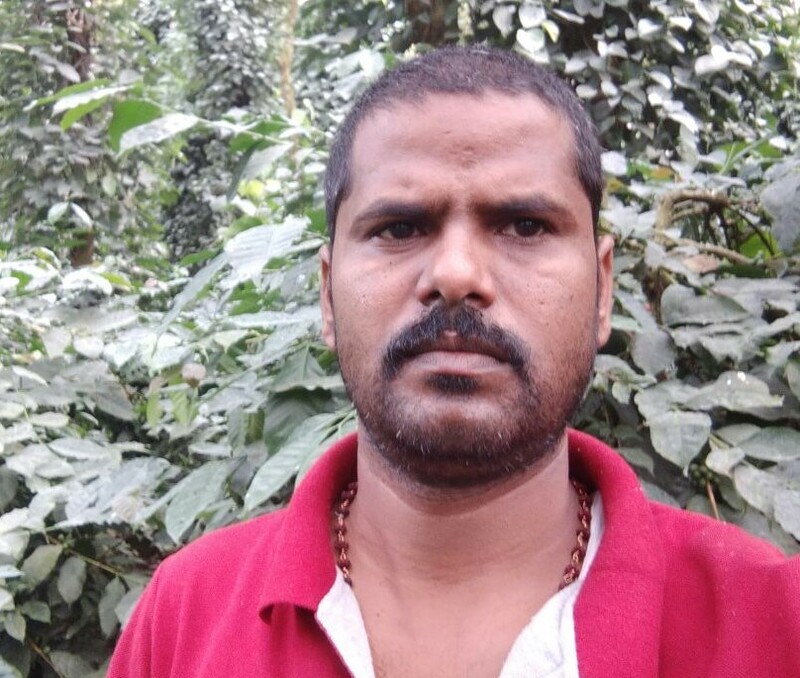 These intercrops boost the coffee yield and give us an additional income,” says Mr. Venkatesh M. T. He manages family owned Thimme Gowda Estate. 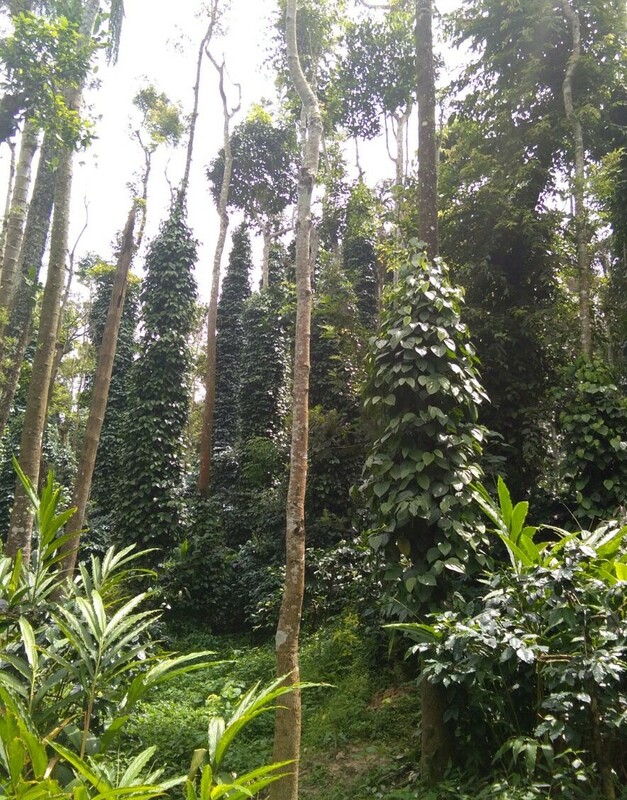 Spread in 12 acres the estate has coffee plantation as the main crop while fruits, spices and forest trees are grown as intercrops to support production and earn additional income. It is located at Kanaguppe village, Hassan district, Karnataka. Due to low yield of coffee Mr. Venkatesh is forced to take up chemical based farming yet in some sections he is practicing organic farming. In case of 100% organic cultivation, “We have to wait for atleast 2-3years for the yield. Unfortunately we do not have much profit in coffee plantation. Intercrop sales supports our income,” he highlights. In organic he uses cattle manure, neem, turmeric and trichoderma. “Chemicals we use are bordeaux mixture (bordo) and opera. To treat gray leaf spot disease that occurs due to high rains in coffee as well as pepper opera chemical is used. Our pepper vines sometimes get affected by wilt disease. We have kept it purely organic farming for banana, arecanut and cardamom,” he adds. Arabica grows well in shade. 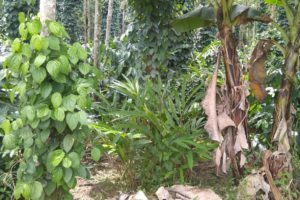 “We have planted jackfruit and mango trees to provide required shade to Arabica coffee. On these trees we have supported black pepper as jackfruit and mango trees have more girth. Also jackfruit trees gives good shade as it branches out for coffee and pepper yield is also good as the roots absorbs moisture which is must for it. Pepper climber are planted atleast 0.5 – 0.45 feet away from these trees. Pepper climber has to be changed after 10-15years. With the help of ladder we pluck pepper,” he shares. 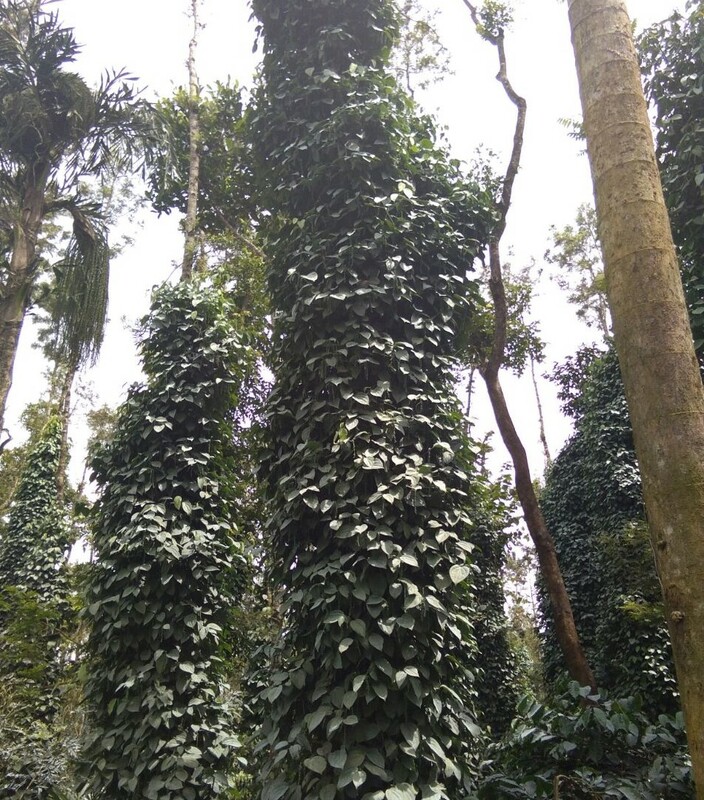 Pepper can also be grown on teak trees but the later are more suitable for hot climate and dry land farming. If grown with teak pepper would need additional water in case rains are less than 70 inch. If the rain is above 70 inch then there is no need of water. Jackfruit trees complement pepper and coffee very well because it absorb all the rain water and keeps the soil moist and so are fig trees. Both trees enhance the yield too. However any sort of wood trees must not be preferred, “These days farmers have started to replace fruit trees with oak trees for higher income but silver oak is not so good for coffee,” he avers. 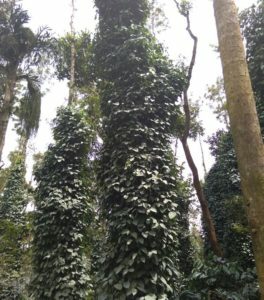 Pepper variety grown in the estate is Paniyur 1,2. “We have 3,000 pepper climbers. We are getting good yield from 1000 climbers. Other 2000 are still young. It would start yielding at the age of 3 years and the production would increase after 6-7years. On an average, yield of pepper is 4kgs/climber,” says Mr. Venkatesh. Root rot disease that attack pepper vines is not seen much in the estate. If it spreads then it spoils 10-20 pepper climbers every year. “As a preventive measure I feed 2-3 litre bordo mixture to the roots of pepper climbers. 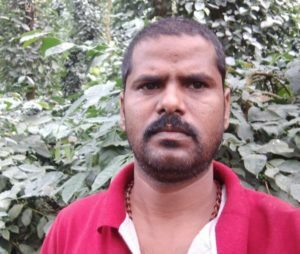 Besides to avoid rot disease we develop the climbers within our farm instead of buying from other nursery,” Mr. Venkatesh states. Banana is sold in local wholesale market. “Also when price is high people come and buy from the farm gate. Coffee and pepper is bought from our house by traders,” he shares. Last year Arabica coffee was sold at Rs. 9700/50kg bag and Rs. 3800/50kg bag for Robusta. Pepper was sold at Rs. 580/kg, cardamom at Rs. 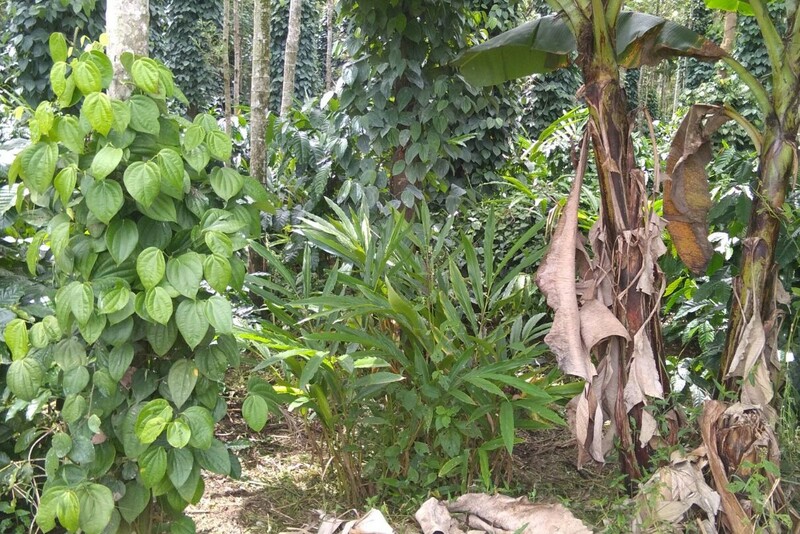 1400/kg (yield was 200kgs), Putta banana at Rs. 35/kg (yield is 5-6kgs/plant), Robusta at Rs.4/kg (yield is 30-40kg/plant). Selling is not a problem because quality of all the produces is superior, “Yet farming is challenging because of extreme price fluctuations. Nonetheless inspite of any challenge or problem I will always continue my agriculture operations because the entire process of crop cultivation is mesmerizing and it is my passion!” signs off Mr. Venkatesh.